Jan 7th, Doing the Polka! Another lame title by me- but surely by now you’ve come to expect a lame title, right? I’m actually showing what I wore on Saturday, since today I have to go to Physical Therapy for a little sciatic nerve problem I’m suffering from. So, if you see me out and about today in sweats, you’ll know why! On Saturday I went to my daughter’s indoor soccer game- so technically, this is a soccer mom outfit! 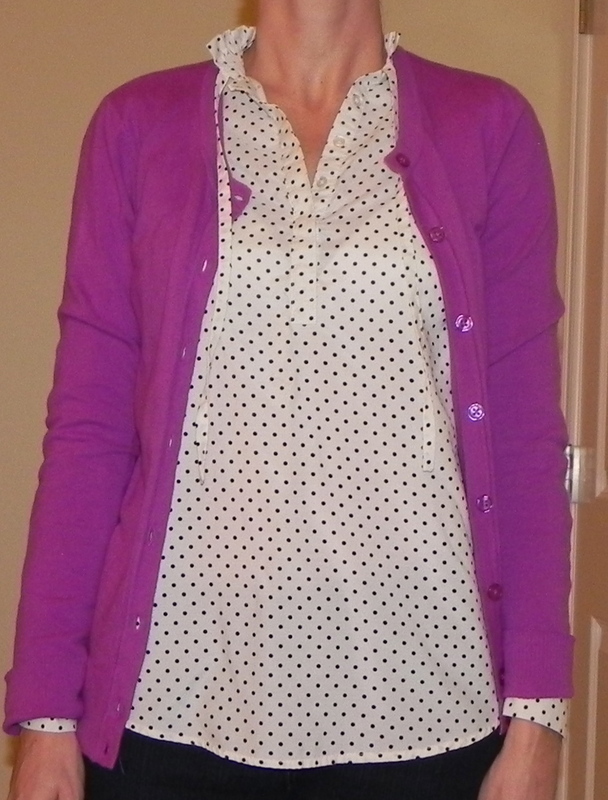 I wore my dark skinny jeans, a cute polka dot blouse and a bright pink (or is this purple?) cardigan. I liked the bright cardigan over the neutral blouse- it’s a good contrast, and so much better than the outfit on the right (do you notice that you can see right through this blouse? Yikes! Hello belly button! I need to add a tank underneath!). I decided that since the blouse has so much going on (between the polka dots and the ties) that I should skip a necklace. What do you think? Should I have added a necklace? If you haven’t already, please hop over to Facebook and ‘like’ me! It’s an ego thing… silly, I know! You look so cute Megan!!! I agree, no necklace. It’s a cute outfit. BTW, I expanded my wardrobe so much by getting the tall black boots! And they are so much warmer than shoes! Why did I resist for so long? I was inspired by your blog to get the boots. That was my ineloquent point. I agree…no necklace needed this time, and it is cute! I hope you feel better soon! AND I hope the nerve problem isn’t affecting your tennis game! Cute blouse. Maybe a bracelet or a simple necklace would be good. Like the outfit. Maybe a small, simple necklace but the outfit looks fine without one. Love the blouse. Totally depends on your style. I’m a less is more kind of girl. I see some amazing bloggers layering tons of jewelry and accessories it just isn’t me.